5 Till You Die: Intense Training Technique For Insane Pumps! Ready to spur some massive growth and push yourself far beyond failure? Try ''5 Till You Die,'' an intense training technique that's guaranteed to give you an epic pump! There are lots of exercises and techniques you can use to finish your body-part workout, but few can match the intensity of "5 Till You Die." If the name tips you off as to what you're in for, you're either gonna embrace the pain or immediately click on to the next article. Apparently you're still with me, so I'm going to take you through how to use this beast-mode technique, which was created by my partner, Kyle Cavner of Destination Gym in Dallas. It guarantees an advanced degree of next-day muscle soreness, the kind you feel after an extended layoff from the gym—only you'll do it by pushing yourself to your absolute limits. The technique works especially well either at the very start of your workout, or at the very end as a finishing move. Because you're pushing so close to failure over a whole string of mini-sets, you might want to do machine-based movements or cables, but that's not a requirement. Explaining this technique is most easily done by example. For this example, I've chosen the triceps dip machine, a fairly standard multijoint triceps exercise you'll find in most gyms. Don't go too shy one the weight; use 60 percent of your one-rep max (1RM), which is just a bit lighter than a weight you can do for 12—and only 12—reps with good form. The weight is important because, if you go too light, you won't get the same kind of pump. Start by doing 5 strict reps, then take a five-second rest. Do another 5-rep set followed by another 5-second break. Continue alternating this work/rest sequence until you can no longer do 5 reps with good form. That may be 4-5 work segments in all. Congratulations! You've now earned a 10-second rest, but the set is not over. Far from it. 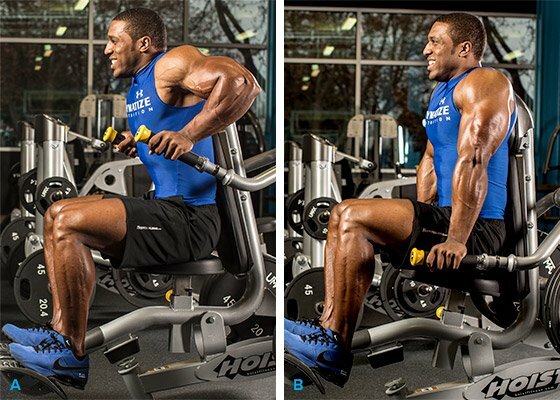 Next up, you'll do the same movement with the same weight for 4 reps, followed by a five-second break, and another 4 reps, and so on until failure—you once again can't complete 4 reps.
After another 10-second break, you probably guessed the next stage is for 3 reps, alternating with five-second rest periods. Once you can't do 3 reps, take another 10-second break and graduate to 2 reps. Two reps, five-second break, another 2 reps, and so on. When you can't do 2 reps, it's another 10-second rest, and then you're on to singles. Do a single rep, rest five seconds, and repeat for 5 total reps.
Watch this video to see me demonstrate how to use the technique with seated cable rows. As you can see, exercise choice is important. Choose movements in which it's easy to get in and out of the start position quickly. From that perspective, a triceps dip machine is better than a skullcrusher. If you've successfully tried the technique, you'll agree it's one of the best pumps you've ever achieved. Why is the pump so important for hard-training lifters? For one, it brings fluids (and nutrients) into the muscle, expanding and pushing against the muscle fascia. Second, the pump is associated with increases in the release of natural hormones like testosterone and growth hormone, which are important for muscle growth. Embracing the temporary pain is the currency of a successful lifter. The question is, do you have what it takes? Let me know how your workout went in the comments below!